« The Linen Tree, After Dark. . . The Mingus Manor Animal Sanctuary – located in Chandler – is a cause dear to The Linen Tree family. Their biggest annual fundraiser is approaching next month. Founded by local resident Karen Scherer, the Mingus Manor Animal Sanctuary is a 501 (c) 3 non-profit organization that provides care for Senior and other Special Needs dogs. These dogs often end up in the sanctuary’s care because their owner passed away, moved to an assisted living facility, or otherwise found themselves unable to spend the time necessary to properly care for their aging dog. Other dogs are found roaming astray, with obvious signs of having been abused. The one thing all of these dogs have in common: they are going through a tough time in their lives, and without Mingus Manor, they would likely end up at the pound. Keep in mind: they are often experiencing a decline in vision, hearing, and overall health, and can easily become disillusioned once they are suddenly separated from those who have cared for them all their life. Even if they were to receive proper medical care at the pound, strange voices, noises, cold concrete, and confinement can create an overwhelming sense of terror and confusion. Please view, below, the brochure for the 3rd Annual Dining With the Dogs dinner – $40 reserves for you a night of cocktails, dining, and dancing. 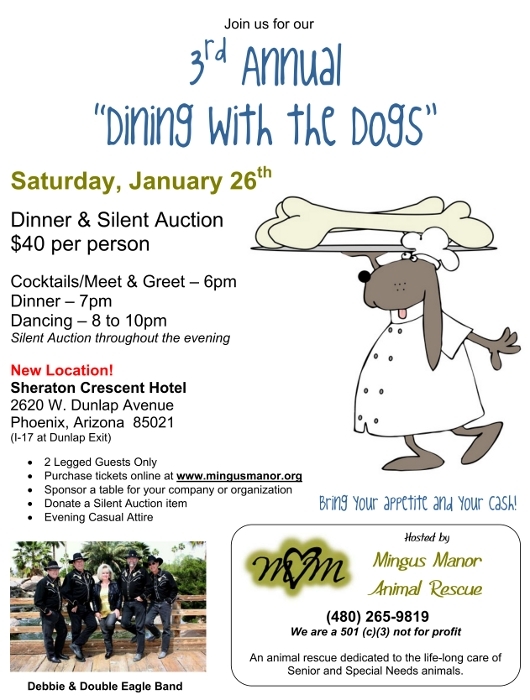 To donate money separately, please visit www.mingusmanor.org or call (602) 296-5568. Please be aware that medical expenses alone cost Mingus Manor in excess of $15,000 per year, and the organization’s budget is almost exclusively dependent on donations and fundraisers. Anything you can give, helps! This entry was posted on Thursday, December 6th, 2012 at 3:13 pm	and is filed under Official Updates. You can follow any responses to this entry through the RSS 2.0 feed. You can leave a response, or trackback from your own site. previous entry: The Linen Tree, After Dark. . .